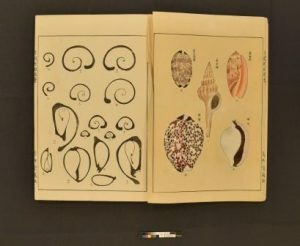 The structure of this book is typical of Japanese bindings and presents conservation challenges not always seen in Western bound books. The book is an accordion folded stab binding sewn with two tackets of purple thread with 2 inches of orange book cloth at both the head and tail of the spine. The stab sewn structure requires the book to rely entirely on the drape (flexibility) of the pages to open. The tonal difference between the printed pages and the illustrated pages. 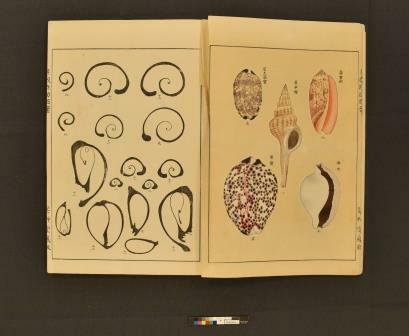 There is one accordion folded set of pages (two pages connected by the fore-edge fold) with colored drawings of shells. These pages are the same paper found in the rest of the book but are far more brittle. There is a distinct tonal difference to these two pages compared to the rest of the pages in the book. A possible cause for the tonal difference is some sort of treatment of the pages in preparation for the drawings that over time has darkened the paper and made it brittle. This brittleness of the paper compromises the drape of the pages which, in turn, has caused these two pages to tear along the spine edge when the book is opened to them. Without disbinding the book, treating these types of tears is challenging. There is limited access to the tears because of their location within the binding and the opening angle of the book. 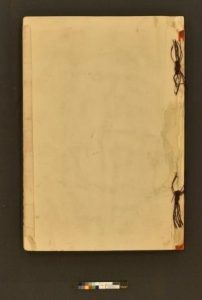 The pages are located near the front of the book. This provides an opening angle to the recto page of approximately 120º, while the opening to the verso page is only 30º. 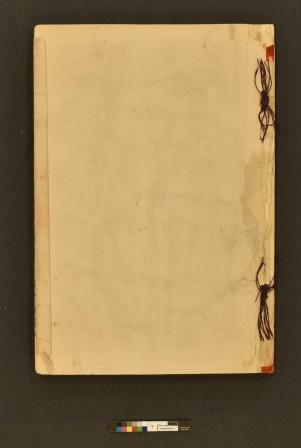 Therefore, repairs were approached from the recto—lifting the recto page along the tear line to facilitate repairs of the verso page. 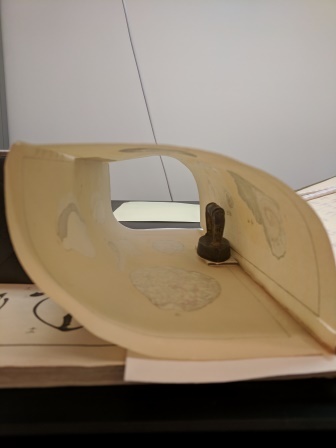 As these repairs progressed, it became clear they would need to be alternated between the pages, verso then recto, to prevent the recto page from tearing out of the book while repairing the verso page. This alternation led me into a particularly tricky repair for a small tear that opened in the verso page as I manipulated it to repair the larger tears. Repairing a tear inside the accordion fold. As you can see in the image left, I used a brick (a small weight) at the fore-edge of the book to hold open the accordion fold. Then rolling up my sleeves, to ensure they did not snag on the brittle page edges, I applied the repair. This involved working blind at times with a hand inside the pages from each side. Once the repair was in place, I placed a mending board on top of it and weighted it to dry. We are fortunate that intricate repairs do not come up too often as they are nerve-wracking and time consuming. However, having them appear every once and awhile is a way to keep skills sharp. The repairs were successful and the pages are no longer threatening to tear out of the book.